Bear Lake offers many wonderful lodging options for your vacation! We have great Hotels, Bed and Breakfasts, Vacation Homes, Cabins, Lodges, Campgrounds and RV Parks. View our lodging map to find lodging for your vacation. Vacation Rental Company. Bear Lake Valley Rentals & Management, Utah & Idaho. 1-18 Bedroom Condos & Cabins for small or large family or group reunions. Elk Ridge Lodge Bear Lake Lodge, Grizzly Bear Cabin & Fish Haven Lodge: Some with dining halls, game room, volleyball, beach access, beachfront, & some where RV’s & tents are allowed, etc. Vacation Rental Company. Papa Bear (sleeps 48), Mama Bear (sleeps 18), and Baby Bear (sleeps 8) cabins can be rented together or separately. Located next to each other and in the heart of Garden City, it’s an easy walk to the lake and to restaurants. Also available is a condo at Ideal Beach (sleeps 14). Brand New corporate lodging and meeting space. All under one roof. Event planning includes lodging, meeting arrangements, food services, customized recreation packages. Open Year Round. Located on the beach, RV Park full and partial hook-ups, 20-30-50 amp service. Cabins, condos and hotel, outdoor and indoor spas, swimming pool, small conference facilities, handicap accessible, laundry, on-site boat rental at the beach. 5 Bedroom 3.5 Bath house Sleeps 22-28 3000 sq. feet Bike path across the street, walk to restaurants, city pool, KOA store, and Go Cart track. 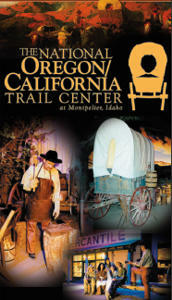 Step Into the Days of the Oregon Trail by taking our simulated Wagon Trail Adventure. You and your family will become members of a simulated wagon train headed west and be guided by our live cast of pioneers whose dialogue and stories will make the adventure come alive! Explore the stories and adventures of emigrants who traveled the Oregon Trail. Travel back to 1849. Hear the story of Peg Leg Smith and his trading post. Visit with pioneers in their wagon train encampment at the Clover Creek grazing area. Hear their story. Learn about their dream. Some of the wagon ruts can still be seen. Offering economy lodging for the Bear Lake area. There are 20 rooms available. Ten of the rooms have kitchenettes. On-site restaurant. Located in the City Center and next to the beach makes it the perfect place to stay and at the lowest rates in town. Has fire pits, picnic tables, free WiFi access. They have two restroom facilities equipped with showers. For some fun use the playground, basketball hoop, volleyball, horseshoes, or recreation room. Glamping Resort and Event Venue featuring Conestoga Wagons and luxury Glamping Tents as accommodations. Perfect for family reunions, couples getaways, retreats, weddings, and groups. Email us. Bear Lake Valley area: 8 Bedroom full log Cabin for small or large family or group reunions. Sleeps 27-40 with huge dining hall, game room, tetherball, commercial playground equipment, volleyball, beach access, RV’s & tents are allowed, etc. Call 520-404-5211. Located at south end of Bear Lake. Full service motel of self-contained cabins, with a bathroom, shower, a queen or two double beds, refrigerator, microwave, and satellite television (DISH). 9000 square foot lodge includes family suites, 3 family areas, 8 bedrooms, 7 bathrooms, a playroom and projection theatre. Pull through RV Sites with sewer, water, and 30 amp & 50 amp electricity. 3 small fully furnished cabins 18 tent sites, a laundry room and showers. Situated right on the shore of beautiful Bear Lake, Ideal Beach offers accommodations for all sizes of families, including direct beach access, onsite pools, mini golf and other fun activities. Vacation Rental Company. Rental properties that will accommodate vacations, family reunions, single overnight stays, custom group getaways, destination weddings, and conventions & business meetings. Bluebird Inn offers Lake View rooms, king size beds, private restrooms, fireplace in each room. Amazing full service sit down breakfast. Honeymoon suite available. 5 bedrooms with private bath, Adults only, no pets. Weddings. Bear Lake State Park’s Eastside camping areas of First Point, South Eden, Cisco Beach, Rainbow Cove, and North Eden, from 4 miles to 12 miles north of Laketown on Cisco Road. The Bear Lake Ranch House is nestled in the foothills of southeastern Idaho at the base of Emigration Canyon. The house can accommodate up to 20. The house and barn can accommodate up to 30+. Multipurpose room in the barn can seat up to 75. 2 night minimum. Please visit our website for availability and rates. Single group site on 3 acres. Available by advance reservation only. Youth groups encouraged, but not required. A-frame picnic shelter, Amphitheater, Culinary water, Tent sites and fire rings, vault toilets. ADA compliant campground. Approximately 30 miles from Bear Lake, in Emigration Canyon. Swimmers will enjoy two-mile-long North Beach on the north end of the lake. The gradual slope of the lake bottom provides an enormous swimming area. Ramps are available for boaters and water skiers who want to enjoy the water, too. NEW! Waterfront 5BR (16 beds) Garden City Home on Bear Lake! Host family/friend gatherings throughout the home’s open layout living areas on the main and upper levels and take in the great outdoors on the huge outdoor patio, deck, and yard. Discount given if booked through phone, not the website. St. Charles Canyon is 17 miles south of Montpelier, Idaho, on U.S. 89. At St. Charles, drive west into the canyon on Forest Road 412. Campgrounds include: St. Charles, Davis Canyon, Porcupine, Cloverleaf, Big Creek, and North Fork. Four Conference rooms and a Bowery for Weddings, Receptions, Family Reunions, Conventions, Business Meetings, Parties, Seminars, Fundraisers, Festivals, Corporate Events and Birthday Parties. Rent lodge for reunions, camps and retreats. Tent Rentals, Tent Site Rentals, 15 full RV Hookups, tent sites, yurt. Downhill skiing and Snowboarding rentals. Sunrise Campground is close to Bear Lake Summit, just 6 miles west of Garden City and Bear Lake, Utah, at an elevation of 7,800 feet. A mixed-growth conifer and aspen forest covers the site, providing partial shade and nice privacy between sites. Sunrise is made up of two loops of single-family sites. Vault toilets and drinking water are provided. Roads and parking spurs are paved. 12 full-service RV slots. Large group camp site can accommodate up to 100 people. Playground, grass play and picnic area, bathrooms, and all located right on waterfront. Marina, ramp, beach, and on-the-water rentals including boats, waverunners, stand-up paddleboards, kayaks, and water tramp. Gorgeous luxury rental lodge Sleeps 26. 6 bedrooms, 5 bath. Great view of Bear Lake, close to State Park Marina near Garden City, bike path, and beaches. Beautiful new luxury cabins are open year round. Each has their own bathroom, extra sink, mini fridge, and microwave. Heated and air conditioned. Pets considered. South end of Bear Lake, approximately two miles northwest of Laketown on SR 30. Four reservable group sites with pavilions. 106 reservable, full hook-up sites. 37 reservable tent sites. Large day use area and beach. Boat rentals available. Book your dream vacation with us and enjoy our private beach, clubhouse, swimming pool and hot tub. The Lake Dream at Legacy Beach sleeps 26+. More rentals coming soon. Great 3 bedroom 2 bath Cabin – less than 0.5 miles to a beach, lake, bike trail, snowmobile trail, fishing pond & park. This comfy cabin sits in the middle of excellent recreation country. It comfortably sleeps 21 people and has all the necessary amenities for a great vacation. Located in downtown Garden City. Big Rig friendly. 60 sites with full hook-ups, wireless internet, pull-thru and tent sites, showers & playground. Harbor your RV with us for the summer; call us for special monthly rates. Lodging – Enjoy gorgeous views of the trees, mountains and meadows that surround us. Snowmobile Rentals, Horseback Riding, RZR Rentals. Schedule your Family Reunion with us. Five bedrooms plus loft; ten beds (seven queen and three double). Drive ATVs and snowmobiles from the cabin. Large, common area with sand volleyball, baseball field, and horseshoe pits. Twenty minutes to Bear Lake. Two bedroom Cabin. Sleeps 8 people. Private beach.